© FarmgirlFare.com, where I still owe you a peep report! 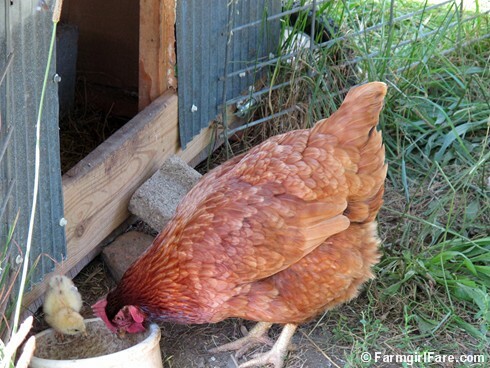 There have been so many 'firsts' with this latest batch of mamas and chicks. And all so peeping cute of course. Hello, many greetings from Hungary, Budapest, every day I visit this side. I very like animals, I have an old dog and 2 cats. This blog very interesting, amusing. What is it about a chick? Why are they made to be so unbelievably cute? Fragile, fluffy, sweet little faces....they slay me. I have lived in the Missouri Ozarks on 10 acres for 3 yrs. after semi-retiring from the corporate world in St. Louis, MO. I love my new peaceful life here among the tall pine trees so much! We put in a beautiful new raised garden this year with everything imaginable. It's doing so much better than it did in years before. It's the only way to garden here where it grows rocks! 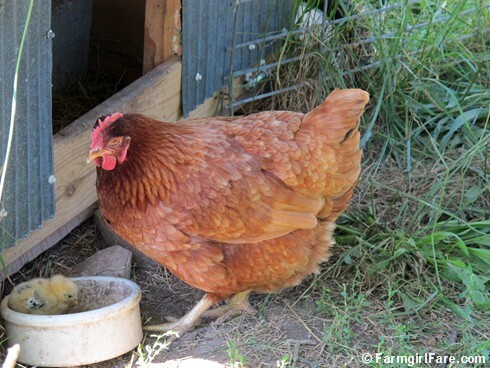 Next spring (if not sooner), I want chickens for eggs. Your chicken and chick are so beautiful. I can't wait! I love your pictures. This one is some kind of wonderful.